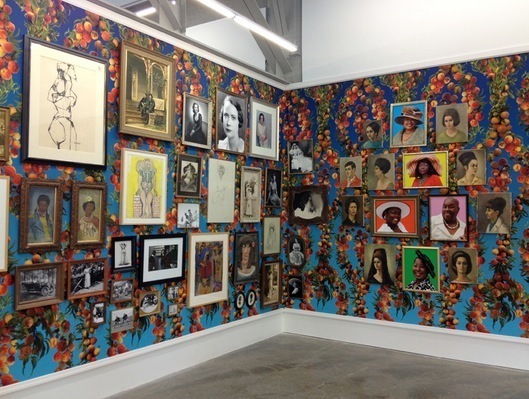 View of “Fallen Fruit of Atlanta,” 2013. Southerners—like most who live outside the centers of taste-making power—can be sensitive to the way they are portrayed. Artists David Burns and Austin Young are aware of this self-consciousness and are intrepid in addressing it in their latest exhibition, “Fallen Fruit of Atlanta,” which comprises an eclectic array of 274 found objects that the duo, known by the name Fallen Fruit, has collected. Organized into eleven salon-style groupings, or “portals,” the objects reflect stages in the development of human consciousness—from birth to self-awareness to death and the afterlife—and were procured from several sources, including Atlanta-based museums, churches, and public archives, as well as from private homes and hands-on art workshops held in conjunction with the exhibition. One portal, titled “The Eight Forms of Mother,” features, among other items, a Harry Callahan photograph of a baby’s head, a child’s Minimalist marker drawing, and Lady in Pain, 1994, a contorted Thornton Dial sculpture from the William Arnett collection that combines a figure of a woman during childbirth with a head of gnarled branches. Other portals feature a tourist postcard, historical images of Jesse Jackson and Helen Keller, family snapshots, lawn jockeys, turn-of-the-century wedding portraits, and other artifacts that span from high to low origins, each in their own way retelling stories about Atlanta. Particularly compelling is “Portal #7: The Women of Society,” a group of naive oil paintings executed by Fanny Bird Jones, the mother of one of Atlanta’s leading art dealers. In the middle of the grouping of regal white women, five recent photographs of black women from the Antioch North Baptist Church stand out in bright colors. The juxtaposition of women of different eras and races, so aesthetically different and yet in such close proximity, points to Atlanta’s history of parallel, hermetically sealed social worlds divided along race and class lines. The worlds coexist, but little is exchanged between them. “Fallen Fruit of Atlanta” marks a departure for the Los Angeles–based artists, who have previously explored social relationships to food. In this current show, however, they have pushed food to the background, allowing the city and its inhabitants to tell their own story.